High-strength heavy plate from Dillinger is indispensable wherever the format, stability and quality of the steels used are of existential importance. In Liebherr’s Type MTC 78000 heavy-lift offshore cranes, for example, the 2,000 tonnes lifting capacity of which puts them among the world’s largest machines of their type. The use of such cranes on (another superlative!) the world’s largest heavy-lift vessels, such as the OSA Goliath, for drilling-rig modifications in the Gulf of Mexico approaches the limits of the load-bearing capacities of both the design and the materials. In addition to their out-of-the-ordinary properties spectrum, including yield strengths of up to 690 MPa, the unique diversity of thicknesses and formats of steels from Dillingen provided the decisive impulse for their use by Liebherr-MCCtec Rostock GmbH in the MTC 78000. These steels ensure the cost-efficient construction of this crane, and lasting dependability in operational service far out at sea. A total of 1,400 tonnes of steel in thicknesses up to 200 millimetres are used in the MTC 78000, 900 tonnes being high-strength steels in Z grade. The basis for these far-reaching projects is provided by the perfect interaction between two industry leaders in quality and technology. Energy needs are rising around the globe, and with them, the necessity of developing new oil and gas fields, and wind farms, in ever deeper seas. The Gulf of Mexico, and the Atlantic Ocean off the coasts of South America and West Africa, are among the most prolific and, in the future, too, promising regions for oil production. Wind and waves shape the adverse environmental conditions prevailing here, and generate forces that attack drilling and production rigs, and installation vessels carrying heavy-lift offshore cranes. The heaving and rolling of the ship on the high seas are transmitted with enormous leverage to the load. The materials used must be capable of dependably coping with these unceasing gyratory motions. Under the pressure of economic efficiency, standards and legal requirements, and of new technological challenges, the offshore industry is therefore making ever more testing demands on materials and equipment. Installation vessels work at sea for several months on end, installing, modifying or dismantling offshore platforms, laying kilometres-long pipelines and setting up offshore wind turbines. At lengths of 180 metres, beams of 32 metres and a 25,812-t gross tonnage, the OSA Goliath and her sister-ship, the Sampson, are among the world’s largest heavy-lift vessels of this type. A total of three cranes are used on board – the Liebherr MTC 78000 heavy-lift crane, with its maximum load of 2,000 tonnes, and two others, with lifting capacities of 100 and 70 tonnes, respectively. 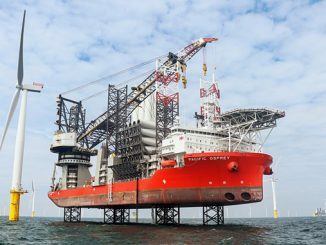 Liebherr-Werk Nenzing GmbH developed the first MTC 78000 heavy-lift offshore crane with a maximum dynamic load torque of 78,000 kNm for the OSA Goliath. 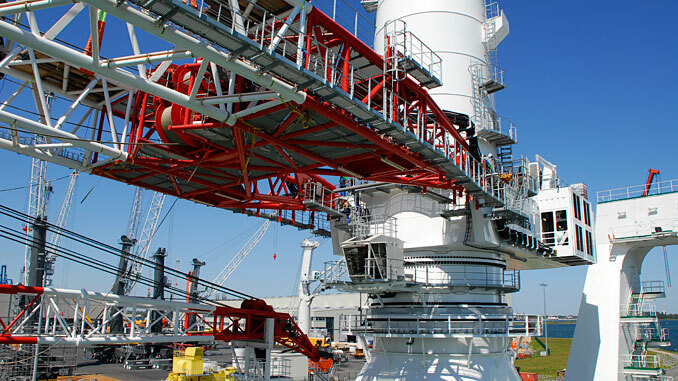 It was then built and installed on the OSA Goliat hat the Liebherr yard in Rostock. The crane can lift its maximum load of 2,000 tonnes – equivalent to the take-off weight of five fully loaded Jumbo jets – with a reach of up to 35 metres. Its lifting capacity within a radius of 74 metres is up to 530 tonnes, and still no less than 500 tonnes at its maximum reach of 87 metres. 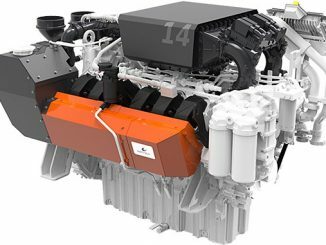 In addition to its main hoist, it also has two auxiliary units, with lifting capacities of 200 and 50 tonnes. Despite its enormous size, the MTC 78000 is designed as a mast-type crane, incorporating conventional slewing-bearing technology, but with one inner and one outer bearing on a single level. These slewing bearings are 9 metres in diameter and are thus almost twice as large as most other rolling-element bearings of this type. They connect the 10-metre-high base column to the turntable, the central element of the crane. This supports two mast sections one above the other, the diameters of which taper from 8.50 metres at the bottom to 3.80 metres at the top. The crane can be rotated through 360° even when bearing its maximum load, since all machinery, winches, etc., are installed above the slewing ring. The base column, at 370 tonnes, the lower mast section, at 250 tonnes, the upper mast section, at 160 tonnes, and the 89-metre-long boom (311 tonnes), make up the crane’s dead-weight of 1,790 tonnes. Compared to all this, the slewing ring, with its “only” approximately 70 tonnes, is virtually a flyweight. Even the quadruple hook on the main hoist weighs in at no less than 66 tonnes. Dillinger supplied a total of 1,400 tonnes of DILLIMAX steels, of which 1,200 tonnes took the form of high-strength heavy plate with minimum yield strengths of 690 MPa, for the construction of the MTC 78000. 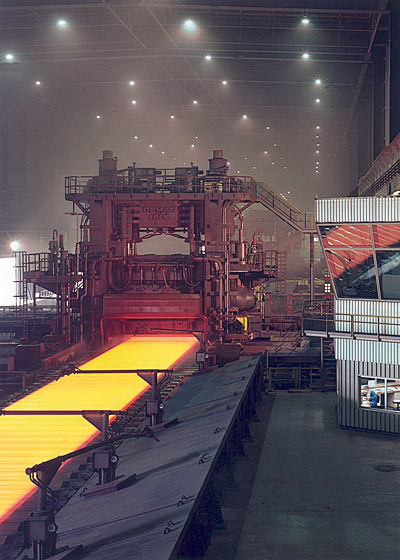 In addition, 900 tonnes of these high-strength heavy plates were produced in conformity to the customer’s unique specifications. This order included 200 mm thick plates, by means of which the girder-mast boom was fastened at its rear end, no less than ten metres wide, to the mast using only two bolts, both of 500 millimetres in diameter and 730 millimetres long. Each of these bolts weighs 1.1 tonnes. The weight of the boom and the forces exerted by the load generate enormous stresses, which the steel used at this most critical point in the crane’s structure must continuously withstand. High-strength heavy plates from Dillinger were also indispensable for the fabrication of the slewing ring. These plates transmit the enormous forces from the mast into the hull of the vessel, generating stresses acting in the plate-thickness direction. Welding of the slewing ring segments gave rise to additional stresses, because the stiff structure hinders shrinkage during cooling. The use of Z grade heavy plates in thicknesses up to 145 millimetres and in sizes which only Dillinger can supply in this grade provided a solution that is both cost-effective and reliable. Such plates are produced from high-strength steel containing only extremely small percentages of undesirable impurities, such as sulphur. Cast into slabs or ingots of a thickness unparalleled anywhere in the world, this steel is homogenised right down into its centre by rolling it at rolling forces of 11,000 tonnes, and then additionally water-quenched. 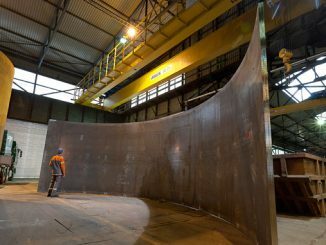 The size of these plates made it possible to fabricate the slewing ring, with its diameter of 9.20 metres, from only four segments, each weighing 35 tonnes. Time and cost-savings of up to 50%, compared to the use of smaller, commercially available plates, were thus achieved for the welding work. Liebherr in Rostock machined all these segments to a thickness of precisely 130 millimetres, in order to assure the necessary absolute flatness. 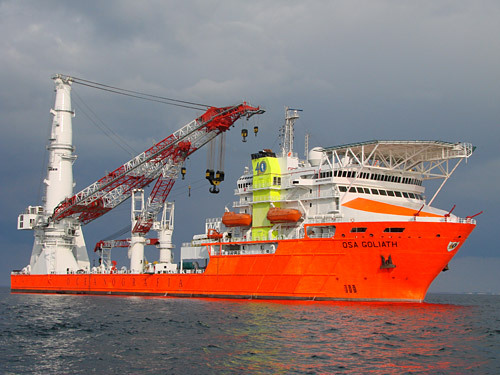 He has now been involved in the completion of three other heavy-lift offshore cranes of this type, all employing only German steel from Dillinger – as specified by the customers. 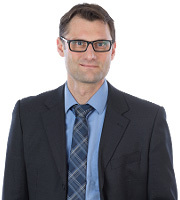 And to the pleasure of Karl Thrumann, of Liebherr Rostock: he very much enjoys working with this highly flexible solution partner, which masters such great challenges on a practically orientated basis and with exemplary adherence to deadlines, using its high-tech products.